Nedbank SA has just invested in a new humanoid robot that will interact with people at their digital branch in Sandton. Pepper was purchased from a Japanese Corporation, Softbank and according to Fabio Machone, Nedbank’s Integrated Channel Officer, they invested between R400 000 – R500 000. Nedbank proudly states that this is the first humanoid robot to have been deployed by any South African organisation. It all seems like a publicity stunt as Peper will be going on a tour around the country beginning in April. The robot will visit other Nedbank branches in SA, kissing babies and interacting with customers. 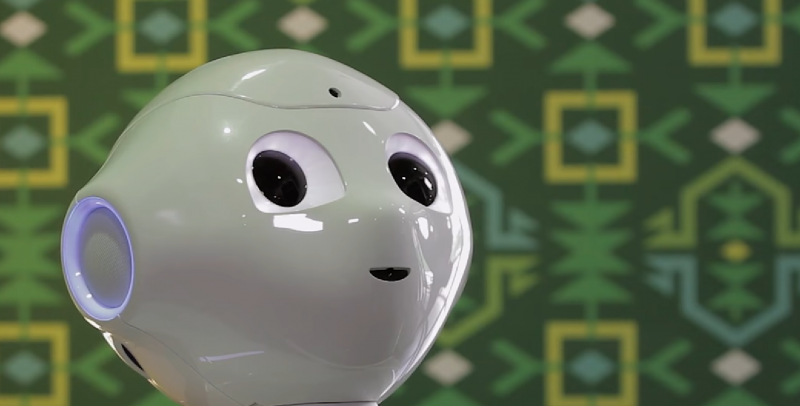 Ok, the kissing babies part is a joke but Pepper can be programmed to recognise voice, basic human emotions, chat with customers and answer questions. Physically, Pepper can’t do much apart from hand and head gestures but has already learnt how to say sanibonani (which means hello of course). They grow up so fast! Ciko Thomas, a Nedbank official says the campaign is meant to showcase the bank’s digital and self-service innovation. They also hope this will create a platform for engagement as a digital ambassador for the bank without actually taking over human interaction. Pepper is also said to be interactive and progressive, which means it will continue to grow and evolve over time. The bank has no fixed idea on how it will use Pepper as of yet. We are not exactly sure what we are going to use it for; we are learning as an organisation. We are buying this piece of hardware with artificial intelligence and we will use the power it brings to us to expand our capabilities. Thomas mentioned the advantages of having a robot over a human. He mentioned that robots hardly get sick nor do they go on holiday. He also emphasised that robots can do repetitive and boring work more efficiently than us. Every time an organisation introduces anything robotic workers shiver in their boots as the next step could be retrenchment. Is this going to be the same with Pepper? In the short term, no. Pepper simply costs too much which in turn makes it prohibitive to get more Peppers. Long-term, however, robots like Pepper will be targetting low-skilled jobs and could end up replacing a lot of jobs. Pepper has already been used in other countries as a waiter, salesman and customer service representative in about 500 companies. Nedbank has also been investing in software robotics(robotics that don’t include humanoids) and has installed 59 software robots with a target of 200 by the end of the year. These robots are expected to cut fewer jobs than the natural attrition. Natural attrition is the rate at which company loses jobs through retirement or resignation. This doesn’t sound like a good thing but more like Nedbank is just trying to downplay the effects of going digital. It’s clear there will be loss of jobs due to robotic innovations what’s not clear is just how many people will be affected. Will MBCA bring a Pepper to Zim? With MBCA rebranding to Nedbank, I think the costs will prevent Pepper or any of his/her kin making their way down here. The fact that Pepper is actually going on a tour around SA should tell you how rare he/she (seriously do these things have a gender? Help me out someone!) actually is.